The installation is smooth. Unzip the program and run the install.exe, reboot the machine and watch it register lots of SOM objects. The installation service is done through the standard IBM install utility. The interface was at first a bit shocking, since I am used to Windows financial software packages which houses everything under one roof. The interface is very WPS integrated. Want to create a new portfolio? Drag n' drop from template into the working folder. Templates reside in the same folder as the data files, but in a split window mechanism which is surprisingly easy to manipulate. The program will prompt you for a name before adding objects, instead of giving a default name like the WPS usually does, but *big* deal! After you create a new master portfolio (or use the samples), you can go into budgets, data trees, reports or accounts. The accounts gives a list of different account categories in which you can open another subfolder and store different accounts all using the WPS - very well done in fact! The account editor reminds me of Quicken, but maybe a bit more primitive (what do I expect for a 1.0 version - Quicken has had many many years behind its belt to get that wonderfully refined feeling). The initial opening of a new account has some color flickering on my 256 color depth display similar to what Netscape does, but it only happens on opening the folder, and it doesn't hinder functionality after that. Money Tree 1.0 seems very stable. In fact, it never crashed on my system at all which is encouraging for a 1.0 product. Some of the interface could use a little bit of polish to match the Windows counter parts, but it doesn't interfere with the usability of the product - and it is not 'ugly' by any means - I think they spent a lot of time on the user interface and it shows. Besides what Windows program can claim such a degree of integration with their shell? User interfaces take a long time to become polished unless simple and this program certainly had a lot of effort put into it! So a bit of spacing issues is okay with me! (I do a lot of desktop publishing so I am particularly sensitive to spacing of dialogs, etc). The 'what ifs' and the 'budgets' and 'reports' go well beyond the normal 'fill out accounting sheet forms' and get right to the heart of what most will need in a financial software package. There are many things available but I simply have not had time to explore everything in a 'first impression' overlook so I will not go into detail trying to list off every little feature. No complaints here. They packed folders full of help and URL links for updates and other information. The tutorial is simple and straight forward (not filled with fluff, gets right into the meat and potatoes with screen shots to boot). I recommend looking at this program as an alternative to using a Windows financial software package. Money Tree has import features for Quicken, so your data already entered is not going to disappear. Yes, it can use a bit of polish here and there, but it is functional and complete with many features for a 1.0 product. If OS/2 users buy this product, I expect to see many great improvements in future versions, so go download and evaluate for yourself! Opconsol is a system logging and command utility that mimics the system log from the IBM MVS mainframe system. It was written by Gary Green of EverGreen Systems and the last version I can find is 1.02.1, dating from February 1996. You might ask why I am reviewing a shareware utility that seems to no longer be developed. Well because it is useful and I'd really like to know if anyone out there knows what became of this app and it's author. I have a number of years experience with IBM mainframes and it is neat to see an application that reminds me of the mainframe console log. Any current or former computer operations folks out there might get a kick out of it also. Just unzip the download file into a directory. Before running it though you have to create a directory named SYSLOG on your C: drive. I neglected to do this the first time I installed it and when I ran opconsol the CPU pegged at 100% and none of the utilities commands worked. Once you are done with this just run OPCONSOL from a command prompt or create a program object and put a shadow of it in your startup folder to have it execute every time you start your system. After I added the required SYSLOG directory, opconsol worked as documented and used very little cpu time. Opconsol will log all your system activity. It shows the time a program started, when it ended, and any significant activity in between. Things like when the programs relative priority changed, when it's thread count changed and when it was brought to the foreground. It displays the program/process name and it's process ID (PID). The author has taken great pains to see that all the commands mimic similar commands on the mainframe system console. I can't go over all the commands but I will touch on the few I have found most useful. The one I found the most useful is the Cancel (C) command. I have mostly used this for killing Netscape when it decides to freeze on me. Just type C P=xxxx where the x's represent the PID. As long as the system is not totally hung opconsol has been able to kill the offending process. This is not a replacement for a Process Commander or Watch Cat or CAD Commander, but if you are just looking for an app to kill an occasional misbehaving app, this will work. Most of the other commands are either not implemented in this version or require applications that support the command or are used to configure opconsol. I use opconsol on my system everyday. It requires a fair amount of disk space, especially if you run your system 24/7, about 200K for 24 hours. It will automatically start a new log every day at midnight, or when you reboot your system. You can also force opconsol to start a new log by using the SWITCH command. You can periodically delete old logs, to save space. This utility is useful in examining what was running on your system at the time of a problem. It is also useful in killing frozen programs, but of no use if the whole system is hung. I'd really like to know if there is a new version of this program around. The documentation said the author was planning to release it as shareware or commercial software, but he doesn't give an email address just a Compuserve userid 72067,1435. David> I use OS/2 for everything. I use it at home and in my home office which, although they are two different "environments", are the same computers and network. I also use it at the job I just took with MCI. At home, I use OS/2 for my personal finances with InCharge. I had used Managing Your Money for years, but switched immediately when I found InCharge. I also liked the fact that Bruce Landeck incorporates suggestions so readily and so quickly. I have had many incremental upgrades of InCharge and they have all added some significant improvements or new features. I also play games. I mean, after all, the computer is the greatest toy since I got my first toy train set. I have a few DOS games, like Railroad Tycoon, and one or two Windows games, a copy of Spaceward, HO!, and, I think, a copy of Sim Earth. My favorite, though is Galactic Civilizations. I think GC II with Shipyards is definitely the most complex simulation game I have ever played. I do enjoy action games somewhat, but my favorites are the simulation games, and GC is the best I have ever played. That computer AI is very dangerous and diabolical at the higher levels of the game. I would swear that it remembers my style of play from one game to the next and uses that knowledge to defeat me. I have only won a very few times with all the opponents at genius or above intelligence levels. I have never won with the Ominorians. I guess that's what keeps me coming back for more. I sometimes wake up at night with a new strategy. For my home office, I use QuickBooks Pro in a Win-OS/2 session for my accounting, but will switch to InCharge in January. I tried to switch this past January when Bruce first came out with the double entry accounting option, but did not have the time to complete the changeover. I also use Warp Server for my home office network OS and Warp 4 for my clients. My Warp Server is also used as a Notes Domino Server. One of my Warp 4 clients is also a secondary Notes Domino Server, and the one which I use for a web server and for my SMTP mail server. I think Notes, and especially the Domino technology is probably the single most important development in computer software in the last ten years - given the existence of the Internet, of course. What is so neat about Domino is that it is a single product which can provide solutions to many types of problems. It can take traditional Notes document type databases and make them available on the internet to users with standard web browsers. I like that and it has been very useful in my business; it has made it possible for me to create the DataBook(tm) for OS/2 Warp with ease and to make it available to customers via the Internet. I use OS/2 at my new work as well. For those of you who don't yet know, I recently took a full-time position as a senior Network Engineer at MCI. MCI has many OS/2 Warp Connect running as clients on Warp Server networks. David> I got started in computers a long time ago in a galaxy far, far away. I was working in the job costing department of a medium sized manufacturing firm in Toledo, Ohio, and we were looking for better ways of doing things. Originally we began by looking at some of the first desktop electronic calculators, you know, the four function kind. I ultimately persuaded them to look at a programmable desktop calculator with much more capabilities than the standard four function jobs. It was an Olivetti Programma 101 and it was the size of an old IBM PC AT. It had 100 programmable steps and the memory was magnetic core for working storage and magnetic cards to store programs and constants on. Very clunky and slow even compared to the original PC, but very much ahead of its time. The last time I went to the Boston Computer Museum they had one of those P101's on display. It made me feel like an old-timer. After that, I moved into computer operations at the same company, but that did not last long for various reasons. We used what was even then an old IBM 1401 and were desperately hoping for a System/360. A few years later I had an opportunity to go to work for IBM. A friend of mine convinced me to apply, and I spent 21 years there. While I was at IBM in Boca Raton in 1981, I was placed on the original development team for the IBM PC. My job was to write the service training course for the IBM Customer Engineers who would be repairing the PCs. I obtained the very first PC off the production line, serial number 00000001 (I think that is the right number of zeros), to use in writing the course. It was actually the very first test of the production line that produced that computer, so for a few weeks, I had one of only about a dozen that were then available in the world. VOICE> Do you remember the specs on that first IBM PC? David> The specs on that first PC were 4.77 MHz 8088 16 bit CPU with an 8 bit data bus and a 20 bit address bus, and 16 KB of RAM soldered onto the system board expandable up to 64 KB. A 32 KB and a 64 KB memory adapter were available. It came standard with a cassette data port. You could order one or two single sided 5.25" diskette drives with a capacity of, I think, 140 KB. Of course no hard drive was available. The diskette adapter also had to be ordered separately and was plugged into one of the five available bus slots. The monochrome video adapter also plugged into a bus slot; the video adapter also had a parallel port adapter on it. A color video adapter (CGA) was available but no color monitor was available. The only communication adapter available was a serial adapter. I purchased one of the original PCs on the employee purchase plan. With 96 KB of RAM, one diskette drive, an 80 CPS dot matrix printer and a monochrome adapter and monitor the price came to almost $5,000. VOICE> At the time did you and your fellow team members realize the importance of that little machine? No, at that time none of us really understood the true importance of the PC. I was in a meeting with Don Estridge, the father of the PC, and some other people one day in the spring of 1981. The projections were that the PC would sell about 275,000 units during a FIVE YEAR life span. There were no plans that I was aware of for follow on products, and no plans for additional connectivity such as networking. I think the PC was originally viewed as a one-time product to take advantage of what seemed to IBM to be a short term fad. At least that was the impression I got from talking to people. The PC was intended to go into a small office or a department of a large company and do one thing all day long. For an accountant it would be an accounting package; for a secretary, the word processor; for a financial analyst, a spreadsheet. There was no conception that the PC would ever be more than a single task device for whoever used it. And because of that, DOS was designed to be single tasking; there was no effort to even think in the direction of multitasking. Of course the PC itself, based on the 8088 as it was, would not have supported multitasking very well anyway. VOICE> Do you know what ever happened to that first off the line PC? David> That first PC I used was eventually scrapped. IBM could not sell it as new and would not sell it as used or reconditioned at that time. So when I was done with it, other people used it for a while and then it was relegated to the scrap heap of computer history. David> Well, I am currently president of the Triangle (North Carolina) OS/2 User's Group, a VP of VOICE, and have memberships in IOTTA, and the Independent Computer Consultant's Association (ICCA). I also write articles for a number of publications. I think my biggest project outside of MCI right now is that of writing the DataBook for OS/2 Warp. That keeps me pretty busy. It does force me to learn more about OS/2 than I would otherwise. In order to write about something effectively I have to DO it. So when I get to something I don't know or maybe know very little about, I spend more time learning before I put it in writing. VOICE> How did you get involved with VOICE? David> VOICE actually had its origins in the March 1997 OS/2 Marketplace Conference sponsored by POSSI. Many of us who attended spent a good deal of time talking about the need for an organization to promote OS/2. One idea which took off at the conference was the trade organization, Iotta. The other was pretty much the brainchild of Tom Nadeau, and that eventually became VOICE. Tom and several others of us agreed that there was a need for an organization like Iotta for the ISVs and consultants, but we also saw the need for a consumer oriented group, one which could be a voice for the consumers of OS/2 and OS/2 related products. I think that is where Tom got the idea for the acronym, VOICE. Then all we had to do was come up with a name for to go with the acronym. VOICE> What does the 'Vice President of VOICE' do? David> Well, I try to represent VOICE when I talk to people in the industry. I try to let them know that OS/2 is alive and well, and that VOICE is a group of users who are interested in OS/2 and OS/2 products. It is a difficult task, because the perception out there is that OS/2 is dead. People are actually surprised when I tell them about VOICE and about the users groups. Most people do not realize that there are organizations devoted to OS/2 out there. I think that some people I talk to are more open to OS/2 when they know that there are other users around. I also participate in the officer's meetings. These are fun and usually provide a lift for me. It is nice to interact, even if through IRC, with other folks who appreciate OS/2 as much as I do. Unfortunately, a prior commitment keeps me from attending the user meetings, but when that commitment is finished I will be back on Wednesday nights. Oct 22, 1997 - Need some expert help? How about joining an OS/2 Mailing List? Here is a list of OS/2 related mailing lists that I know of. If you know of any missing from the list, send me mail at editor@os2voice.org with the list address, how to subscribe to the list and a brief description of the list. Details on this mailing list is available at http://www.gdma.com/cgi-bin/lwgate. os2wp@gdma.com OS/2 Word Processing discussions. pmmail@gdma.com An alternative PMMail discussion forum. incharge@gdma.com InCharge discussion list. 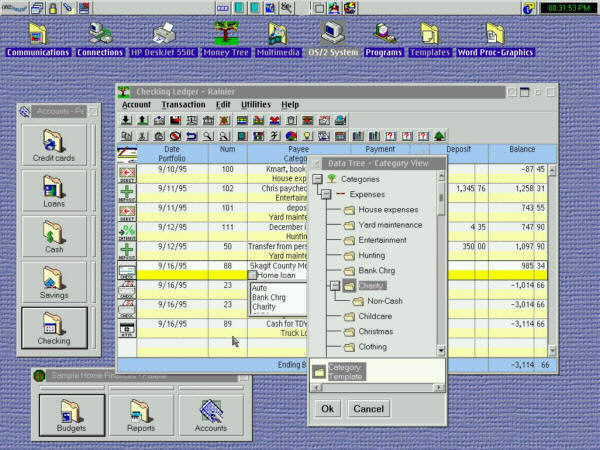 InCharge is an OS/2 native home/small business accounting package. IBM's Warp FM newsletter - This is the IBM PSP division monthly newsletter focused on OS/2subscribe warpfm your@mailaddress to Majordomo@www.software.hosting.ibm.com. Warp Cast - This is an OS/2 news announcement list maintained by the folks at OS/2 e-Zine. To subscribe, unsubscribe, or for more information on WarpCast, visit: http://www.os2ezine.com/warpcast/. MERLINBETA-L Merlin Beta Discussion List. This is still in existence, awaiting the next OS/2 beta program ( Oh where, oh where is Warp 5.0? ). To subscribe send SUBSCRIBE MERLINBETA-L in the body of an email to listserv@hearn.nic.surfnet.nl. BMT Micro List - New product annoucements, automatic notification about new releases of existing programs, news about BMT Micro, and more. For details on subscribing to this list http://www.bmtmicro.com/info/update.html. NeoN Grafix 3D discussion mail list. To subscribe send neon3d-l yourfirstname yourlastname in the subject to listserv@vm.ege.edu.tr. Oct 18, 1997 - Are you considering signing up for IBM's Software Choice program? If so check out Loren Bandiera's OS/2 Warp News and Rumours site, http://catbert.istar.ca/os2/, for the scoop on this new individual user upgrade plan for OS/2 Warp, Warp Server and Warp Server Advanced. Up until now the offerings at the Software Choice site -http://www.software.ibm.com/os/warp/swchoice/ have been free. They have just recently added TCP/IP v4.1 there though, and that requires a ID and password to download. Software Choice for Warp 4.0, can be purchased by US residents at Indelible Blue - http://www.indelible-blue.com/. Oct 15, 1997 - On Team-OS/2 Help list Sergei Makarov gave instructions on how to get rid of the dancing elephant that pops up to remind you to register Warp. Open using GUI drive object, not from the command line. Oct 13, 1997 - The main site for the RSU (remote software updates) is http://ps.software.ibm.com/softupd.html. From there you can get to any current fixpacks offered as well as information on what RSU is and how to back out an RSU installed fixpack. The latest fixpack for Warp 4.0 is now FP4 and for Warp 3.0 it is FP32. On this site is also news that IBM is now making the latest fixpacks (public or controlled) generally available to the public. Also there is a post here on installing IDE hard drives greater then 4.3 Gig. Oct 8, 1997 - If you still use the command line in OS/2, then you probably still use the DIR command. If you want to customize it so you don't have to keep adding switches you can put a SET DIRCMD in your CONFIG.SYS file. To find all the possible parameters go to an OS/2 command prompt and type HELP DIR. A suggested example is DIRCMD=/P/OGN This will pause after each screen full and sort the entries with directories first and then by alphabetic order by file name. While IBM toil away for their corporate customers on future versions of OS/2, WorkSpace on Demand, and so forth, I would like to take some time to remind everyone (including IBM) that OS/2 has a number of SOHO and home users who chose OS/2 because of it's clear superiority to the other choices for desktop operating systems. I will give voice here to some of the end user concerns that seem to be getting overlooked by IBM when it comes time to make upgrades to OS/2. These suggestions come from many users of varying backgrounds and levels of technical skill. Final fix for/removal of the Single Input Queue either by use of a Virtual SIQ (which would hinder only those applications which require its existence and leave the rest of the system unscathed) or by removing the compatibility with older 16-bit OS/2 programs. It is my understanding that the SIQ exists primarily for these older programs, so removing them should remove all SIQ troubles. Furthermore, we are now 5 versions into the 32-bit OS/2 model--16-bit compatibility has long outlived its usefulness. A queue hang is about as bad as a full system lockup since you can't get at anything even if it is still running. Anti-aliased display fonts. These make reading over long periods of time much easier on the eyes, and they're much more WYSIWYG considering printed fonts are not as jagged as Warp's current display fonts. Hot-loadable device drivers both to reduce the size of the config.sys file (and thus shorten bootup time) and to save memory when a driver isn't needed. If PC-DOS 7 has this, why doesn't OS/2? Surely OS/2 is more capable than any flavor of DOS. Competitive pricing with other popular desktop OSes. While Warp 4 may come in typically at a slightly lower price that Windows NT, you could buy 2 or more copies of Win95 for the price of one copy of OS/2 these days. When you're bringing in several billion dollars a year in profits on licensing, mainframes, AIX, OS/2 Server, PCs, etc, I think it's not impossible to sell the OS/2 workstation version for less than $170 (full package) and $120 (upgrade). Repeat customers are a good thing--give them an incentive to keep buying from you rather than jumping ship due to price increases. Symmetric Multiprocessing in the workstation version. With SMP-enabled motherboards becoming somewhat more common and coming down in price, it would be nice to have such support out-of-the-box with OS/2. Windows NT Workstation has it, why is OS/2 running behind? Fully 32-bit device drivers. Not only will this not turn away developers who currently have to code with 16-bit restrictions, but it will save system resources by not requiring "thunking" of 16-bit drivers to 32-bit memory space at runtime. New file system which allows for faster, more reliable chkdsk scans and fixes, continues to support extended attributes, and allows for greater than 2MB of disk cache for the ever-increasing number of people who have 32+ MB of RAM. And above all else. . .
More support of hardware & software developers so we don't have to wait 6+ months after a product is released before we have native support for it. Multimedia and entertainment are areas severely lacking on OS/2, and even if IBM hates the idea of games on OS/2, the idea of decent audio & video should please them. How can any of their corporate customers give a multimedia presentation without soundcard drivers, decent modern AVI or QuickTime codecs, etc? Not only would corporate users benefit from this, but end users would as well, as we might then have a fair number of plugins for Netscape Navigator for OS/2 and we might have a few more games for ourselves thanks to the fact that we would have EnDIVE, OpenGL, and so forth. One hand washes the other, and building a solid multimedia base creates opportunities for other software developments which could make OS/2 much more popular among end users.